In the course of a lifetime, we all endure moments that range from unpleasant to dangerous to downright destructive. Sometimes those hard experiences get submerged deep inside our hearts. Like a small stream running through limestone, they cause erosion at such a slow rate we don’t even see it happening. Then one day, the erosion becomes a pothole. Then the pothole opens up into a sink hole. The unseen erosion gradually swallows us. I was struggling to understand why I was such an angry mom. I had never been a particularly angry person, but my toddlers got the worst of me. I discovered I had stuffed away a lot of feelings in my first thirty years and mothering was pulling out all.the.feelings. Each feeling I stuffed down rained a few more drops into the small stream running through me. I didn’t know my heart was experiencing erosion until the hole opened and nearly swallowed me. Erosion can lead to potholes, but it can also make something beautiful. 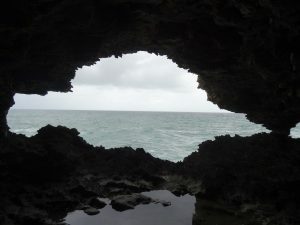 This is Animal Flower Cave on the northern tip of Barbados. Sea anemones, called “Animal Flowers” by the locals, live inside the cave and give it its name. My family and I went there once and I took this picture. This is the view looking out at the Atlantic Ocean from inside the cave. Every edge of the cave is sort of saw-toothed like you see here. The cave floor is a combination of sandy tidal pools and rocks worn smooth by untold years of sea intrusion. At high tide, waves fill the cave, but at low tide the ocean’s waves are only a backdrop to a peaceful silence. The small anemones sit in perfectly clear water, gathering sustenance when the water moves over them. The cave is dark, but light enters through big openings like this one. This is, quite literally, the edge of Barbados. It is a limestone island and the ocean crashes in here and other places, too. Inside this cavity created by erosion, it is beautiful and peaceful. I think we each have an Animal Flower Cave inside of us. We’re all damaged by life, but maybe that damage can be transformed into something beautiful. God is calling me to return to relationship with him. Is my soul listening? Our eroded places don’t have to remain empty. Reconciliation with God (restoration of our broken relationship) has been made possible by God. God is with me, loving me, even in my state of erosion. Even in my cave. What is taken away from us by emotional erosion, can be given fresh form and renewed and bound tightly to us through the love of God. 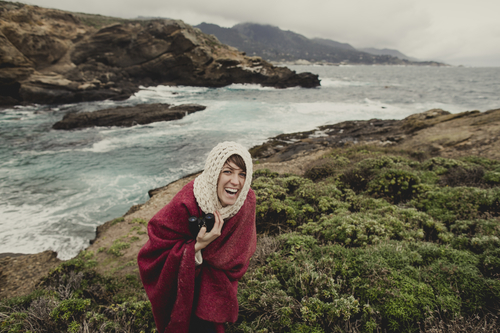 When our core is eroded by hard experiences and big feelings, God can step in and bring beauty to the eroded places. What about you? Do you have some eroded places? Are you stuffing feelings down and raining into your inner stream? Do you think God can give fresh form and renew what has ebbed away from you? Tell me about it in the comments, in an e-mail, or on Facebook.